Are you considering adding an inground swimming pool to your backyard? If you are, there are many different shapes, designs, and swimming pool features to choose from. The fun part of designing your custom inground gunite swimming pool is that you aren’t limited to just a square, rectangular or other prefabricated shapes, like you are when building a fiberglass or liner pool. This allows you to design your pool any shape that you want to. In addition to designing your pool any shape that you like, you can also add any pool feature you would like, allowing you to build your dream oasis. Freeform pool shapes are the most space-friendly and popular pool shape. With a freeform shape, you can customize your pool’s shape in any way that works best for you and your yard. Free-form pools generally have more curves than other pool shapes, allowing you to build a truly unique oasis. If you are artistic, have a clear idea of what you want, or are looking to have a one of a kind shaped pool, a freeform pool would be the best choice for you. Kidney shaped pools are a classic custom free-form pool, shaped like a kidney bean, round on both sides and curved inwards on one edge. The kidney pool shape is excellent for pools with added water features such as waterfalls and grottos. Figure 8 shaped pools, taper a bit from the middle and are rounded on both ends. One of the best things about figure 8 shaped swimming pools is that you can feel the free flow of water. On sharp edges of a rectangular pools, the water tends to refract strongly after hitting the walls. The curves of this pool shape help the water to circulate instead of being refracted backward. While rectangles are not the most creative pool shape, they are one of the most common and classic pool shapes. Most apartment buildings or skyscrapers, due to lack of space, tend to adopt this form for their pools. You can find this shape of pools in honeymoon suites and in penthouses on their balconies as well. L-shaped pools are as impressive as the name. The vertical shank of the L is generally shorter and of smaller width, while the other part of the oasis is longer and has more breadth. This form of a pool is useful for courtyards with unique needs. Oval shaped pools work great for large oases, and yards. If you visit an old Victorian home, and it has a pool, it is common to find this shape of a pool. This type of pool shape is one of the standards when you hear people talk about swimming pools as an “oasis in the backyard”, partly due to its size. Natural decorations like palm trees or small hedges go very well with oval shaped pools. Like oval shaped pools, circular pools are best suited for open and larger spaces. Many indoor pools are circular because it is easier to build an enclosure for this form of pool. The compounds help maintain the quality of the pool water and save it from dust and other contamination. 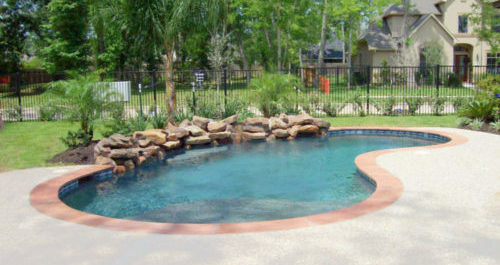 Circular shaped pools are also a common shape for children’s pools. Geometric pools go with the shape of your backyard and have sharp geometric edges. Geometrically shaped pools look like a cascade of geometric shapes throughout the area. If your lawn is in a forest area, this pool shape will give an appearance of ancient water reserves. Adding stairs throughout your backyard oasis will further enhance the appearance of old beauty. The shape of the Greek pool is famous for its spacious and beautiful design. Greek shaped pools are similar to rectangular shaped pools, but the corners are tilted at 45 ° like a kite or curved inwards. This form of a pool is suitable for larger areas and larger families, as it typically can accommodate more people at a time, and is best for big yards. Last but not least, Roman shaped pools give a significant effect to any backyard environment. Roman shaped pools are a large rectangular pool with domes that emerge outward on both sides. One of the domes usually has stairs to enter the oasis. This form is excellent for sunbathing since the stairs provide a rather large platform to relax on while in the water. Are you ready for your new swimming pool? Don’t forget that Platinum Pools can walk you through the entire process, from the initial designing, building process, all the way to your completed dream oasis. It all starts with a phone call at 281.870.1600 (Houston), 409.898.4995 (Beaumont), or 361.576.0183 (Victoria). Remember, Platinum Pools can prove the difference.